Evolution are one of the last truly great WWE stables. 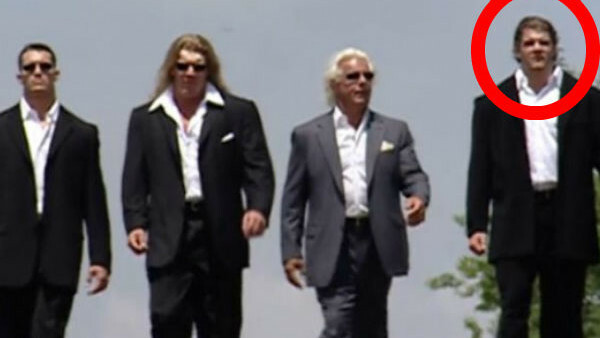 Triple H, Ric Flair, Randy Orton, and Batista represented several generations of wrestling excellence, and at the peak of their powers, they were utterly dominant. There was a period of time where Evolution held all of Raw’s titles (the Tag Team, Intercontinental, and World Heavyweight Championships) and while Flair and Triple H were already established megastars, the group was the making of Orton and Batista. It could have been oh so different had WWE followed through with their original idea, though: Mark Jindrak was originally pegged for Batista’s spot as Evolution’s Arn Anderson-esque enforcer. WWE went so far as to shoot a number of vignettes with Jindrak in the group, but the former WCW Tag Team Champion was pulled without explanation. Jindrak has since revealed that he “wasn’t ready” for the spot, and that it was “his to lose” and he “dropped the ball.” It worked to his detriment: Jindrak was released from WWE after a meagre four-year run largely spent propping up the midcard, while Batista became a multi-time world champion and surefire Hall of Fame inductee. Jindrak has since forged a strong career for himself in Mexico, but he must be kicking himself that the Evolution run never came to pass.